YWHAZ (also known as 14-3-3 zeta) is a member of 14-3-3 proteins which were the first phosphoserine/phosphothreonine-binding proteins to be discovered. 14-3-3 family members interact with a wide spectrum of proteins and possess diverse functions. Mammals express seven distinct 14-3-3 isoforms (gamma, epsilon, beta, zeta, sigma, theta, tau) that form multiple homo- and hetero- dimmers. 14-3-3 proteins display the highest expression levels in the brain, and have been implicated in several neurodegenerative diseases, including Alzheimer's disease and amyotrophic lateral sclerosis. 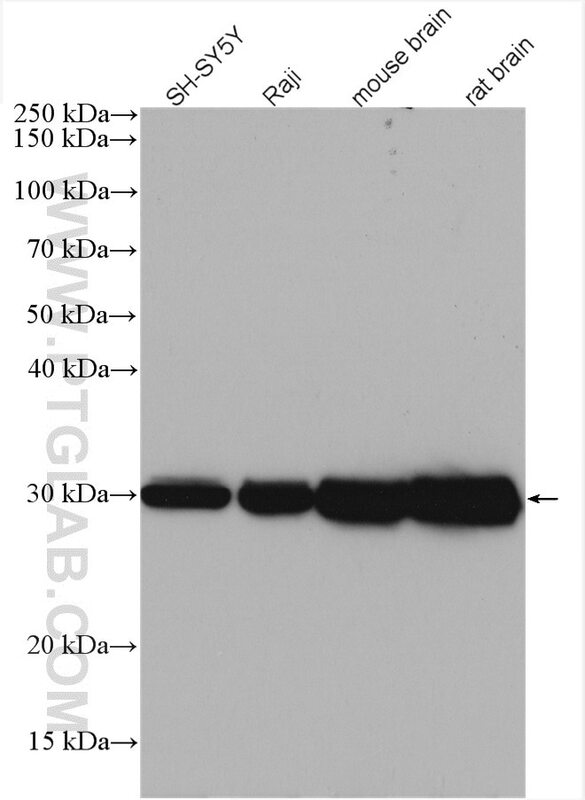 This antibody was raised against the full-length YWHAZ. TRIP13 promotes tumor growth and is associated with poor prognosis in colorectal cancer. Lysine-specific demethylase 1 promotes the stemness and chemoresistance of Lgr5(+) liver cancer initiating cells by suppressing negative regulators of β-catenin signaling. The ASH1-miR-375-YWHAZ Signaling Axis Regulates Tumor Properties in Hepatocellular Carcinoma. YWHAZ Binds to TRIM21 but Is Not Involved in TRIM21-stimulated Osteosarcoma Cell Proliferation. miR-155 downregulates ErbB2 and suppresses ErbB2-induced malignant transformation of breast epithelial cells.